The Gateway Lodge was built by radio and theatre magnate John King of Detroit, Michigan. His portrait still hangs in Gateway's main lobby today, as shown in the above photo. King initially considered Watersmeet, Michigan and Phelps (previously known as Hackney), Wisconsin as sites for the complex, but ultimately chose the town of Land O'Lakes, located in Vilas County, Wisconsin. Groundbreaking for the Gateway Lodge began in 1937, and construction of all the planned buildings, except the airport, was completed in 1938. 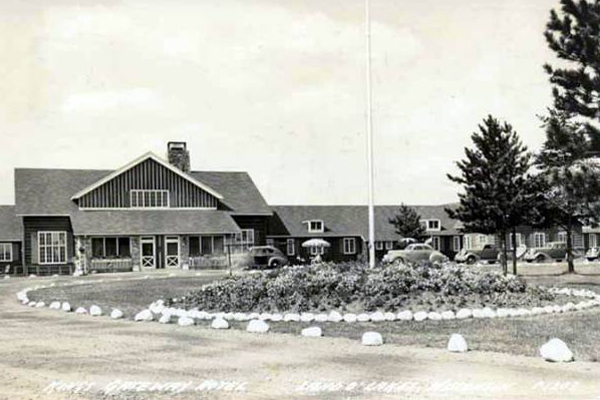 The original complex consisted of the main lodge; the inn, located across County Highway B; the golf course, located west of the lodge; the trapshooting fields of the Gateway Gun Club, located east of the lodge; the ski jump, also located east of the lodge; the ski chalet with attendant downhill skiing areas, located just one-half mile from the lodge, east of Highway 45; the riding stables and employee housing, located northeast of the lodge in Michigan on Crystal Lake Road. The airport would eventually be located to the south, behind the lodge. The original cost to build the Gateway Lodge was $100,000. The going rate for a tradesman's labor was 37 cents per hour. At the time, the guest â€œshuttle serviceâ€� from the Land O'Lakes train station to the lodge was by horse and buggy. The main lodge was originally a one-story structure with approximately 65 guest rooms. Some had private baths, but most rooms shared hallway baths. All the beams were hand-hewn timbers that were hand-hewn and given a burnt-brown finish. This finish was achieved by applying red-hot irons to the surface of the beam, removing the charred wood and then coating the surface with varnish. The paneling was made of native pine pieced together in the traditional tongue and groove manner. The beauty of this local craftsmanship is still awe-inspiring and welcomes today's guests with its exemplary artistry. This can be seen in the above photo and in photos of the Vintage Inn Supper Club, the original dining room of the lodge. Porcelain-handled doors were custom constructed on site to fit each individual opening. Some of the rooms still contain interior closet doors with these very same original porcelain handles. On the exterior of the lodge, neon lighting was installed under the building's eaves and around the gables. The entire structure simply glowed at night. This feature still functions today and creates that same striking appearance in the dark of the great Northwoods. Vic Rossi and The Kings of Rhythm entertained from 1938 to 1945. Biaggio Colavecchi, another one of the first musicians hired by King, entertained for many years thereafter on Friday nights. When asked if he knew a particular tune, he'd say he wrote it. The inn, located partly in Wisconsin and partly in Michigan, cost $200,000 to build. It contained bowling lanes; a billiard hall; a large dance floor with almost nightly entertainment; banquet and lounge facilities; and areas for gambling — which, at the time, was legal. Helping to contribute to the higher construction cost of the inn was the fact that its furniture was custom built. The cabinetry, booths and other interior woodwork were handcrafted by carpenter Felix Turnquist. Only 24 years old at the time, Turnquist was a Land O'Lakes local. Long before the days of automatic pinsetting machines for bowling lanes, the Gateway employed people to do that job. Pinsetters were paid ten cents per game. Quite often their tips were dollar bills which had been stuffed into a bowling ball's holes and then rolled down a lane to them. Now named the Stateline Inn, rumors abound that the floors of the inn were once painted with a line, so you'd know which state you were in. Many of the inn's original beams are still in existence and can be seen today. Currently, the Stateline Inn is owned by the Mendham family and Draeger Enterprises. Architect Robert Bruce Harris designed the nine-hole golf course. For a time, it was the only course in the United States where golfers could play one round in two different states. The golf course is now operated by the Renk family and features a par of 36 and a putting range. The Gateway Gun Club hosted annual trapshoots in both autumn and spring. Hundreds of sport shooters from the Midwest, and across the country, were regular participants. The gun club has continued this tradition to the present day. One of a kind in the Midwest, the Gateway Lodge Ski Club's ski jump attracted skiers from around the world. In fact, on Sunday March 12, 1939, Reidar Andersen of Norway set a hill record jump of 100 feet. Unofficially tying that distance record was a jump made by local Class B Rider John Zoberaski, of the Gogebic Range Ski Club. After Zoberaski's jump, Andersen made two other jumps of 102 feet and 10 feet. Unfortunately, both jumps were also unofficial, but they were the longest jumps ever made in the history of the hill. Andersen was a very well-known competitor in the 1930s ski jumping community. He was the winner of the 1936 Olympic Bronze Medal for the Men's Individual Large Hill event. Andersen is also the only person to ever win the Holmenkollen Ski Festival's Men's Ski Jumping Competition for three years in a row — 1936, 1937 and 1938. The design of the lodge's interior was replicated in the interior of the ski chalet. Access to the downhill skiing areas and the chalet was most convenient for the guests of the lodge, as it was only one-half mile away. Many enjoyed going down its variety of hills in the clean, crisp freshness of Wisconsin winter air. The riding stables on Crystal Lake Road, northeast of the lodge, provided countless hours of entertainment for guests. The employee housing was also located there. Throughout several decades of the Gateway Lodge's existence, nearly all of the residents of Land O'Lakes have worked at one or another of its facilities. It was the area's largest employer until Nagel's Lumber Mill took its place. Originally a grass landing strip, the airport was constructed in the early 40s. In those first years, pilots would land and taxi you right up to the lodge's dining room door for a delicious lunch or dinner. Between 1946 and 1950, the building that housed flight operations was moved to the golf course. Today it is the course's club house. Its interior architecture is similar in design to that of the lodge. During the 40s and 50s, formal attire was required at the Gateway Lodge. The Stan Kellar Trio took over the entertainment from 1946 to 1949. Through King's affiliations in the entertainment industry, he brought many well-known figures to stay and play at the lodge, including Bob Hope, Lawrence Welk, movie star Mitzi Gaynor and the comedy team of Bud Abbot & Lou Costello. The possibility of seeing or meeting one of these celebrities attracted many guests from Milwaukee and Chicago, keeping the Chicago & Northwest Railway very busy. During World War II the complex was periodically used as a military training site. There has also been much speculation over the years as to whether or not President Eisenhower actually stayed at the Gateway Lodge. Leroy Aiken, (President of John Hopkins University and father-in-law to Ike's brother, Milton Eisenhower), rented the cottage behind the Main Lodge during a few summers. It is documented that, in later years, the President's son, David Eisenhower, had been here on various fishing trips. A visit to the lodge by President Eisenhower is highly probable, but he most likely stayed at King's personal residence located on Snap Jack Lake. 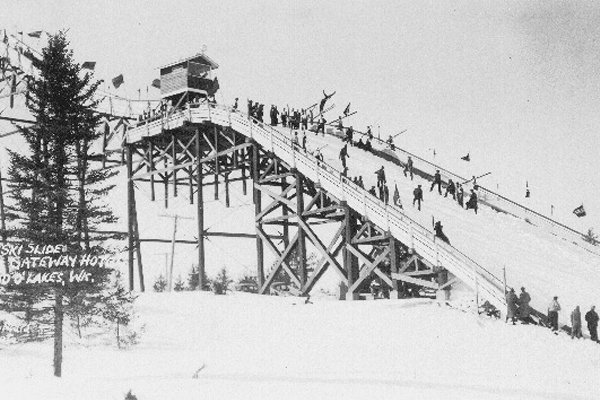 The ski jump was dismantled in 1946, mainly due to the popularity of many new, larger ski sites available only an hour away in Michigan. Its timbers were saved and now grace the main building of the Red Man Supper Club, located in the town of Land Oâ€˜Lakes. 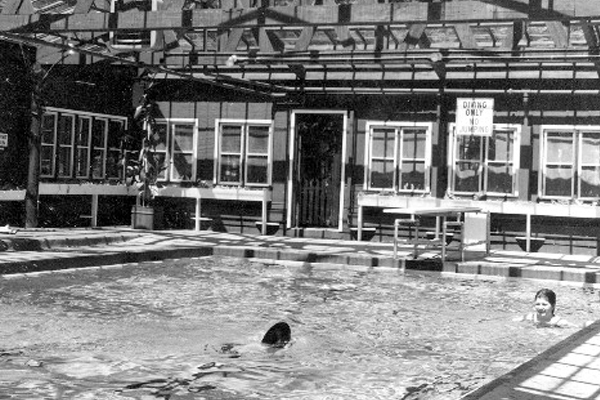 After King died on January 2, 1952, his family continued to operate the Gateway Lodge complex in its originally constructed format until 1961. In the mid-50s, North Central Airways brought commercial flights to Land O'Lakes. The Federal Aviation Administration would not allow commercial carriers to land at private airports, so King's widow, Sugar (affectionately known as "Shug"), deeded the facility to the town of Land O'Lakes. It is now known as the Land O'Lakes Municipal Airport, where Barry Aviation currently provides flight services. 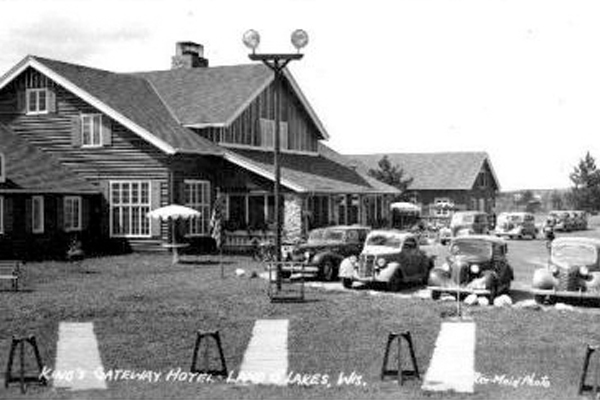 Mr. Walter Williamson, (owner of the Wagon Wheel Resort in Rockton, Illinois), purchased the Gateway Lodge on February 17, 1961. He added a second floor and reconfigured the rooms on the first floor. Williamson also built a swimming pool with an overhead glass and beam atrium and a redwood sauna. After his historic Apollo 8 space mission to the moon, astronaut Jim Lovell used the Gateway Lodge as his secret retreat. The Gateway Lodge was still considered a premier vacation destination, but was experiencing a bit of financial difficulty. Gambling had become illegal, and the loss of this revenue made maintaining the property, and operating it at a profit, quite a challenge for management. Williamson sold the Gateway Lodge to Mr. Degayner in the early 70s. Unfortunately, Degayner couldn't really afford the property, and he lost it after only one year. All of the lodge's furnishings, antiques and celebrity autographed pictures were sold at auction. A bank took control of the property. Thankfully, the metal sculpture of three black bears (the logo for the Lodge), hanging on the brick chimney of the main lodge's lobby fireplace, escaped this sad fate. It has never moved from that same location throughout the history of the Gateway Lodge. From the early 70s to the early 90s, the golf course was leased and operated by Bob Chase. In 1976, Mr. Sampson, (who owned the Red Carpet Inn in Milwaukee), purchased the Gateway Lodge. He returned as many of the old furnishings and artwork as he could in an attempt to reignite the Gateway's unique appeal and elegantly rustic atmosphere. Samson sold the Gateway Lodge in the early 80s to American International Vacations, a time-share company located in Las Vegas, Nevada. AIV enlarged the outside walls of the east and west wings by another ten feet to add kitchenettes to all of the guest rooms. The time-share was very successful for three years and then fell victim to lack of funding and changing social trends. Ownership reverted to a bank in Portland, Oregon. At this point, there was no longer an atrium over the pool. In October of 1989, the bank sold the Gateway Lodge to Robert and Diane Yarbrough from Valentine, Nebraska. They acted as developers to convert the Lodge to a condominium form of ownership. The conversion process began almost immediately. The guest rooms now totaled 72 individually owned condominium units. The common areas were owned collectively. In 1990, four-time All-American Trapshooting Champion John Muir came from Pennsylvania to take over management of the Gateway Gun Club. Along with 10 years of experience as a professional shooter for the Winchester Gun Company, Muir is the Pennsylvania State Record Holder for Trapshooting, with a perfect score of 600/600. As manager, Muir re-vamped the layout of the Gateway's traps and built a world-class sporting clays course — only the third of its kind in the entire state of Wisconsin. Muir's reputation and expertise drew thousands of sport shooters to experience the majesty of great Northwoods shooting. The many shooting guests staying at the Gateway Lodge was a welcome infusion of income to its management and helped to keep it running smoothly. In fact, Muir's promotion of the Gateway Gun Club won the honor of hosting both the 1994 and 1999 State Sporting Clays Championships. From being a six-time member of the Pennsylvania All-State Shooting Team, Muir became a four-time member of Wisconsin's All-State Team and twice has been the state's High Average Leader. Once again, the name “Gateway” evoked the image of elegant accommodations for classic sport-shooting getaways. The inn was sold in the early 90s to an independent party and received a facelift. The Yarbrough's remaining interest in the Gateway Lodge was purchased in 1993 by the condo association. In November of 1994, the association began an aggressive five-year renovation program. The recreational facility was completely reconstructed and reopened in January of 1995. The heat and hot water system were converted to propane in February of â€˜95. In March of that year, new carpeting was installed in both the first floor's hallway and stairway. July of â€˜95 saw the start of painting the lodge's exterior. During 1994, thanks to Karl Kerscher, the Land O'Lakes Municipal Airport received federal funding for a major property overhaul. Improvements included runway expansion and taxiway resurfacing. Private jets are now able to land there. By July of 1997, the condo association installed new beds, pillows, bed linens, ceiling fans, televisions, telephones and carpeting in all of the units. The Ski Chalet was sold to Ed Richter, the owner of Richter Ready Mix & Construction. He wanted the property as the ski hills were, and continue to be, a major source of the area's gravel. In 1997, Richter donated the actual building of the Ski Chalet to the Land O'Lakes Historical Society. They moved the building to Land O'Lakes Town Park where it currently houses the Land O'Lakes Historical Museum. Also in 1997, the dining room and lounge were sold to be independently owned and operated. Anne Marie and Emilio Gervilla introduced their famous Mediterranean cuisine to tempt the palates of Northwoods diners. They were owners of five restaurants in the Chicagoland area. The restaurant was named Emilio's Gateway to the Mediterranean, operating from 1997 to 1998. Today the Gateway Lodge is governed by the Master Association through a Board of Directors elected from its membership. A guest rental program offers individual owners the choice to participate in the hotel business. Renovations to the units continue with new window treatments and door locks, along with upgrades to their bathrooms and kitchenettes. For more information, visit our accommodations page. From 2001 to 2002 Susan and Alex Artaega owned and operated the restaurant under the name The King's Grille in honor of the founder of the lodge. 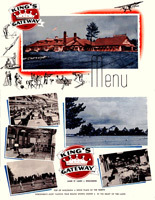 In 2002, the restaurant was sold to a partnership and re-named The Gateway Inn, in tribute to the original inn, located across County Highway B. It was operated by owner Babbette Balus for breakfast and lunch. Owners Linda and John Bellman operated it for dinner. Late in 2002, Linda and John Bellman bought out Balus' interest in the business and changed the name to The Bellman's Gateway Inn. They ran the restaurant from 2002-2005. In October, 2005, new owners Christina and Keith Williams opened the Vintage Inn Supper Club. They offer guests of the Gateway Lodge a menu of mouthwatering Midwestern and Continental dining specialties, served in elegant surroundings with a warm family atmosphere. The Gateway Lounge is now operated by the association management. A wide selection of fine beverages are available along with a variety of live entertainment. Friendly, efficient bartenders are there to promptly serve you. True to its almost century-old historic traditions, the Gateway Gun Club still operates fields with manually set traps. The world-class sporting clays course, constructed in 1990, has again made the Gateway Lodge a premier destination for the country's sport shooters. Tournaments, held each year April through September, attract a full slate of participants. Professional gun manager John Muir oversees the entire operation. Lessons are available. For more information, check out the current schedule of shooting events. We hope that you have enjoyed reading about our history and will consider a stay with us at the Gateway Lodge. Refresh yourself and enjoy the scenic splendor of our country's great Northwoods. Experience a return to a vintage era and absorb its aura of classic traditions. We want you to create special memories to look back on, and savor, for many years to come. The Gateway Lodge has always been noted for its heritage of elegantly accommodating its guests, and we strive to continue that standard of excellence. Special thanks to Georgia Ayotte, Ann Bates, Bob Chase, Henry Mitchell, Cherry Wagner and Liz Wagner for their contributions of historical information. Can You Help Us Recover Some Of Our Past? We are in search of items that originally belonged to the Gateway Lodge (or Wagon Wheel Resort), but were auctioned off or sold. The return of items that may have once belonged to either location can help us restore the luster to our heritage. Donations of any such items would be gratefully accepted and much appreciated.